Arthroscopic repair of the ATFL with or without augmentation is one of the most popular surgical procedures for chronic ankle instability. Arthroscopic techniques of ATFL repair and augmentation (Broström-Gould procedures) were recently described. The advantages of an arthroscopic procedure are not only the assessment and treatment of associated lesions but also the complete ligament assessment and all-inside technique for ATFL repair. The main difficulty is to have criteria to decide whether ATFL is still present to perform a repair or if it is too weak or absent and needs a reconstruction. In this field, arthroscopy remains the best tool to have a complete and objective assessment of ATFL. Arthroscopic technique of ATFL repair with and without augmentation is described to provide guidelines for a reliable and efficient technique. 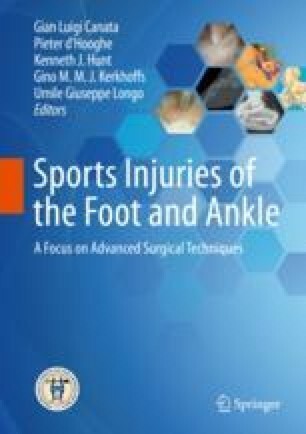 Vega J, Allmendinger J, Malagelada F, Guelfi M, Dalmau-Pastor M. Combined arthroscopic all-inside repair of lateral and medial ankle ligaments is an effective treatment for rotational ankle instability. Knee Surg Sports Traumatol Arthrosc. 2017; https://doi.org/10.1007/s00167-017-4736-y.